A.D. 69. The Roman Empire is up for the taking. The Year of Four Emperors will change everything-especially the lives of two sisters with a very personal stake in the outcome. Elegant and ambitious, Cornelia embodies the essence of the perfect Roman wife. She lives to one day see her loyal husband as Emperor. Her sister Marcella is more aloof, content to witness history rather than make it. But when a bloody coup turns their world upside-down, both women must maneuver carefully just to stay alive. As Cornelia tries to pick up the pieces of her shattered dreams, Marcella discovers a hidden talent for influencing the most powerful men in Rome. In the end, though, there can only be one Emperor...and one Empress. One of my favorite reads of last year was Kate Quinn’s Mistress of Rome and so when the release of her second book Daughters of Rome was announced I immediately knew I had to get my hands on a copy! And boy am I glad I did!! Thanks to Quinn I have a new go-to author for novels sets in Ancient Rome. In Daughters of Rome we follow two sisters and two cousins who were collectively known as the “Cornelias” because they all share the same name (thankfully for the reader all but the oldest are called by their nicknames). The novel takes place during a turbulent time in Rome’s history called The Year of the Four Emporers, when deception and turmoil ruled the land and the four patrician women are ensnared in the chaos. Cornelia, the eldest, is married to a man soon-to-be named heir to Emperor Nero and has the elegance and charm that is ideal in a politician’s wife. Marcella is the historian of the family, happy with watching events unfold and recording them for posterity. Then there are my two favorite characters, cousins Lollia and Diana. Lollia, the lustful “Cornelia” whose grandfather marries her off again and again depending on what benefits the alliance will bring him and totally indifferent about her feelings on the matter. And Diana, the most beautiful of the “Cornelias” who loves horses and chariot racing to distraction and is oblivious to the string of suitors that pursue her. The lives of these four women will be forever changed during the Year of Four Emperors and their destinies shaped by the upheaval of their country. Quinn brings Ancient Rome to life in vivid and captivating fashion. 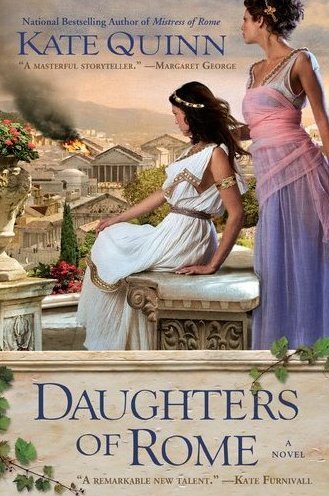 Fast moving and action packed, Daughters of Rome is an exciting read that will have you turning pages as quick as you can! For more information please visit Kate Quinn's WEBSITE and BLOG. I've heard some great things about this book, but I haven't read it yet, I'm really looking forward to it. I love reading about that particular time period. Thanks for the heads up. After I visited Rome in the fall, I've been wild for anything set in that awesome city. I'll definitely be reading this one! I really enjoyed Mistress of Rome... and just bought this one this week. After reading your review I'm looking forward to it! I have the first of these books but haven't gotten to it yet. I will be sure to follow it up with this one right away. They both sound like wonderful reads. What lovely comments! Amy, thanks for a wonderful review; I'm so glad you enjoyed "Daughters of Rome." I have heard nothing but good things about Kate Quinn's books. Her love for Rome and the fact that she has written these books so early in her career will hopefully lead to many more good books from her. Just finished "Daughters" last night, and I must say I enjoyed it even more than "Mistress." The pacing is great, the characters interesting. I don't feel I learned a ton from reading it, but I do now know who the Four Emperors were, so that's something. A breezy, fun read with an engaging setting.